With the return of warmer days and the bounty of summer crops, gourmets will tend to favour simple delicious desserts. 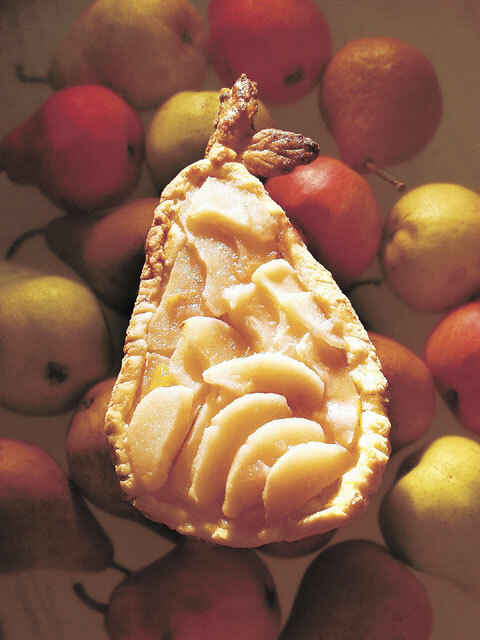 This month, we therefore recommend three desserts inspired by Erik Satie's 1903 piano composition Trois morceaux en forme de poire: a pear sherbet, pears poached in red wine and a pear galette. Depending on your inspiration you might choose to make only one or you could offer your guests the whole trio, made up of a poached Japanese pear (much smaller), a mini biscuit-cake (taking special care to cut the pear into smaller pieces) and a serving of sherbet using a melon spoon. Certainly a highly extravagant composer known for his wit and inimitable puns, Satie, judging from his correspondence, enjoyed an ambiguous relationship with the culinary arts. In an article dealing with the topic, "The art of the table" (mentioned in the writings collected by Ornella Volta, the great specialist of the velvet gentleman) he wrote: "Personally I have always had the greatest admiration, an unbounded admiration actually, for the culinary arts. I am far from indifferent to a good meal. I would even say that I have a sort of respect for it, and maybe more [...] For me, eating is naturally a duty--a pleasant, festive duty--and I really want to perform this duty with exactitude and due attention. My appetite is good and I eat for myself, without selfishness or the urge to wolf things down. In other words, 'My posture is better at a table than on horseback'--even though I ride rather well. [...] During a meal I play a central role: I am a table guest just as at the theatre some people are spectators. Yes... the spectator has a well-defined role: he listens and sees; the guest eats and drinks. In a way it's the same thing--in spite of all the differences between the two roles. "Dishes that require a calculated virtuosity or a discriminating science to make are not the ones that hold my 'taste' attention. In art, I love simplicity just as I do in food. I will applaud the well-done roast more than the meat lost under the ingenious layers made by a sauce master--if you don't mind my saying so." "Trois morceaux en forme de poire"
In 1903, Satie composed a piano piece for four hands entitled "Trois morceaux en forme de poire avec une manière de commencement, une prolongation du même et un en plus, suivi d'une redite," which despite the title is actually five pieces. For Satie, the number three had a predominant importance: it was a sort of golden mean. All of the Master of Arcueil's humorous period works come in threes. Anne Rey explains in Satie, published in Seuil's Solfèges collection: "It has been proven that Satie related the symbolism of the number three to a specific way of making music and listening to it in an attitude that must be qualified as mystical." We have already presented this recipe in our La cena musicale column dealing with "Pears Belle-Hélène" in March 2002. Bring 450 ml (2 cups) of Merlot (or any other fruity red wine) and 75 ml (1/3 cup) of sugar to a simmer. Peel and core (a melon spoon can be handy here) three ripe but firm pears (Bosc, Bartlett or Anjou), preserving the stem. Carefully place them in the liquid. Cover and poach the fruit on low heat for 10 to 20 minutes, depending on the pears. Remove the pears from the liquid. Bring the liquid to a quick boil until syrup forms (about 10 minutes). To serve, warm the pears in the syrup, place them in serving dishes and pour a little syrup over them. The oldest of all pastries according to the Larousse gastronomique, made primarily in the French countryside, this biscuit-cake is baked without a mould. You can give it any shape you want (why not try a pear shape?). This preparation can be warmed up a little before being served, (recipe adapted from Classic Home Desserts by Richard Sax, Chapters Publishing, 1994). Galette: In a food processor or in a bowl, mix the flour, sugar and salt. Incorporate the butter cut up into small pieces. Beat 1 egg and 5 ml of milk in a cup. Pour about half the whipped egg on the flour, sugar and salt preparation and shape into a ball. It should be sticky. Refrigerate in wax paper for approximately 30 minutes. On a floured surface, spread out the dough into a 25-cm circular (or any other) shape. Place the dough on a buttered metal plate. Fold up the edge of the dough about 1/2 cm. Groove the edges and apply a little whipped egg. With a brush, spread a layer of apricot, pear or peach jam on the bottom of the biscuit cake. Refrigerate the dough while you prepare the pears. Pears: Peel, slice into quarters and core 3 or 4 pears. Slice each of the quarters into 5 or 6 sections.